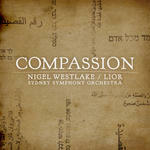 Compassion / Nigel Westlake, Lior ; Sydney Symphony Orchestra. Compassion : a song cycle in seven movements based on a collection of ancient Hebrew and Arabic texts / L. Attar, N. Westlake. Compassion : a song cycle in seven movements based on a collection of ancient Hebrew and Arabic texts STUDY SCORE / L. Attar, N. Westlake. Compassion" draws from the rich worlds of Islam and Judaism to present a collection of profound and poetic messages surrounding the idea of compassion between human beings. The texts are largely a collection of poems, proverbs and songs that give us an insight into such wisdom. Their similarities are immense and their universality is undeniable. Far from the misguided commentaries that have so often steered humanity away from the true enactment of compassion, these texts affirm that attaining a greater sense of compassion is an ultimate goal, and letting it guide our actions is the ultimate wisdom. Instrumentation: 2 flutes (2nd doubling piccolo/alto flute), 2 oboes (2nd doubling cor anglais), 2 clarinets (2nd doubling bass clarinet), 2 bassoons (2nd doubling contra-bassoon), 4 horns, 3 trumpets, 2 trombones, bass trombone, tuba, harp, piano/celeste, percussion (5 players), timpani, strings (14.12.10.8.6), tenor voice (amplified). Contents note: 1. Sim Shalom: Grant Peace -- 2. Eize Hu Chacham? Who is Wise? -- 3. La Yu’minu: Until You Love Your Brother -- 4. Inna Rifqa: The Beauty Within -- 5. Al Takshu L’vavchem: Don’t Harden Your Hearts -- 6. Ma Wadani Ahadun: Until the End of Time -- 7. Avinu Malkeinu: Hymn of Compassion. Commission note: Commissioned by Sydney Symphony. Kit: Compassion : a song cycle in seven movements, for symphony orchestra and solo voice by Nigel Westlake and Lior Attar, music education kit / by Philip Cooney. 22 Mar 2019: at Compassion (Federation Concert Hall, Hobart). Featuring Lior, Nigel Westlake, Tasmanian Symphony Orchestra. 12 Oct 2018: at Opening Gala (Southcombe Park Stadium ). Featuring Damien Eckersley, Claire Edwardes, Daniel de Borah, Tinalley String Quartet, Lior, Zoe Black. 13 May 2018: at Compassion (Robert Blackwood Concert Hall). Featuring Monash Academy Orchestra, Nigel Westlake, Lior. 12 Mar 2018: at Adelaide Festival: Compassion (Adelaide Town Hall). Featuring Tinalley String Quartet, Andrew Meisel, Claire Edwardes, Daniel de Borah, Lior. 11 Jul 2017: at Lior and the Australian Youth Orchestra (Melbourne Recital Centre, Elisabeth Murdoch Hall). Featuring Australian Youth Orchestra, Nigel Westlake, Lior. 10 Jul 2017: at Lior and the Australian Youth Orchestra (Melbourne Recital Centre, Elisabeth Murdoch Hall). Featuring Lior, Australian Youth Orchestra, Nigel Westlake. 15 Feb 2014: at Lior and Nigel Westlake - Compassion (Sidney Myer Music Bowl). Featuring Nigel Westlake, Lior, Melbourne Symphony Orchestra. 7 Feb 2014: at Compassion: Lior and Westlake (Festival Theatre - Adelaide Festival Centre). Featuring Nigel Westlake, Adelaide Symphony Orchestra, Lior. 7 Feb 2014: at ASO: Lior & Westlake (Festival Theatre - Adelaide Festival Centre). Featuring Nigel Westlake, Adelaide Symphony Orchestra. 11 Dec 2013: at WASO: Lior & Westlake (Perth Concert Hall). Featuring Lior, Nigel Westlake, West Australian Symphony Orchestra. 28 Sep 2013: at QSO: Compassion (Westlake & Lior) (QPAC Concert Hall). Featuring Queensland Symphony Orchestra, Nigel Westlake, Lior. 7 Sep 2013: at Sydney Symphony: Lior & Westlake (Sydney Opera House, Concert Hall). Featuring Nigel Westlake, Lior, Sydney Symphony. 6 Sep 2013: at Sydney Symphony: Lior & Westlake (Sydney Opera House, Concert Hall). Featuring Lior, Nigel Westlake, Sydney Symphony. Sep 13: Sydney Opera House. Featuring Sydney Symphony, Lior, Nigel Westlake.